P-51B Mustang Serial number 43-12214, VF-C, “Rebel Queen” flown by Capt Fred Glover of the 4th FG, 336th FS in which he scored 10.3 victories. 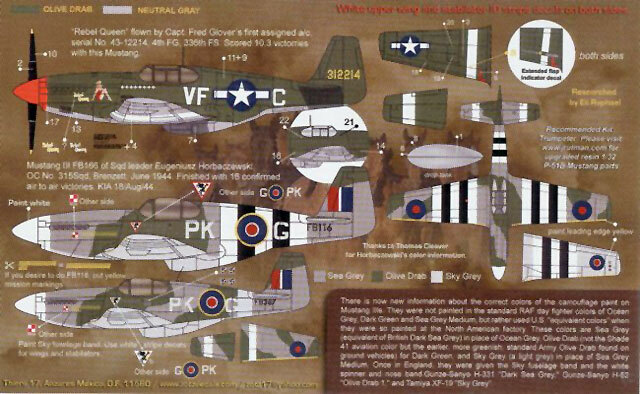 The aircraft was finished in Olive Drab upper surfaces and Neutral Grey lower surfaces and has a red propeller spinner. The aircraft has nose art of a blond lady in red negligee painted on the left engine cowl. White theatre bands are painted on the upper and lower surfaces of the wing and on the horizontal tail surfaces.